If you have seen National Lampoon’s Christmas Vacation, you probably recall the tragic scene where Clark goes into the living room to find the string lights on the Christmas tree are out. After noticing the plugs are disconnected, he then goes to plug them back into the outlet, and unbeknownst to him, Aunt Bethany’s cat (which she brought as a gift) has the other end of the lights under the chair. This conundrum brings an ill-fated finale to the furry feline, for comedy’s sake. However, there is often truth in comedy, and this scene reveals the actual added dangers the holiday and all of its décor can create for pets. We hope these holiday pet safety tips will keep your furry friends happy and healthy while the halls are decked with boughs of holly (which is surprisingly toxic to animals, by the way). Find a safe corner for your Christmas tree. This way, it is more blocked off from your pet’s curiosity. If this doesn’t work and your dog or cat still jumps onto the tree, you can place bells or some other audible object (aluminum foil, a plastic drink bottle filled with pebbles), or anything else that creates noise on the tree’s bottom limbs to alert you of an approaching tree calamity. Sweep up fallen tree needles regularly. These are sharper than you know, and can easily get stuck in a pet’s paw or throat. They can also injure the lining of your pet’s intestines. Plus, they can be toxic if ingested by your cat or dog. Skip the tinsel and ribbon. While sparkly and stunning, these tree decorations are not for homes with pets, unless you hang them up out of your pet’s reach. According to veterinarians*, pets are notorious for eating tinsel and ribbon, which can potentially block their intestines. You don’t want to spend your holiday with a pet undergoing emergency surgery. Ornaments and baubles will always look like toys to pets; their round shape reminds them of balls. The small size is another misleading visual that makes your pets want to play! All ornaments need to be kept out of reach, and made from unbreakable material. Never let your pet drink tree water from the tree stand. Sap and other toxic preservatives can harm your pet. Avoid edible tree decorations. Whether they be candy canes, cranberry or popcorn strings, they are an invitation to disaster for pets. These treats are enticing and your pet will surely tug at them, try to eat them, or get their collar entangled in the string, and potentially knock over your gorgeous tree or harm your pet. Christmas lights on the tree (and elsewhere in the home) pose a hazard to curious pets. Chewing on cords and lights may cause electric shocks and burns in the mouth. Check cords regularly for signs of chewing and general wear and tear. And it’s always a good idea to avoid stringing lights toward the bottom of the tree. Train your pet. Veterinarians* say this is sometimes the most overlooked yet effective tip. Beginning with the very first Christmas your pet experiences, it’s smart to train your pet to leave the tree alone. Just like teaching your dog to sit, reward them with a treat and praise when they listen and obey your commands. Cats can be less trainable, but veterinarians recommend using a spray bottle with water to deter cats from whatever mischief they are getting into. Christmas can be an overwhelming season for pets. The familiar home they know so well transforms into a miniature North Pole overnight, filled with all the lights and action of Santa’s workshop, including the main attraction: a twinkling tree. 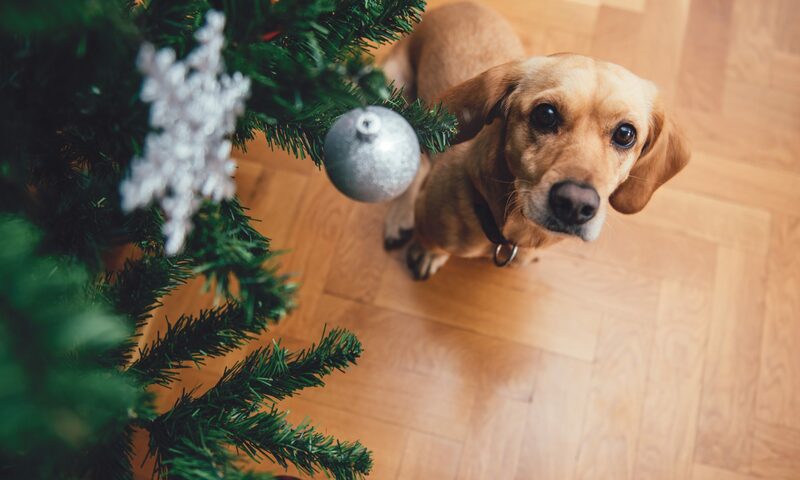 Following these essential Christmas tree guidelines, when it comes to your pets’ safety, should help ensure that your furry friends have an incident-free, calm and cozy holiday.